[150 Pages Report] Visual analytics enables business users to access business data and analyze them to generate visual insights, even if they do not have data science and analytical skills. 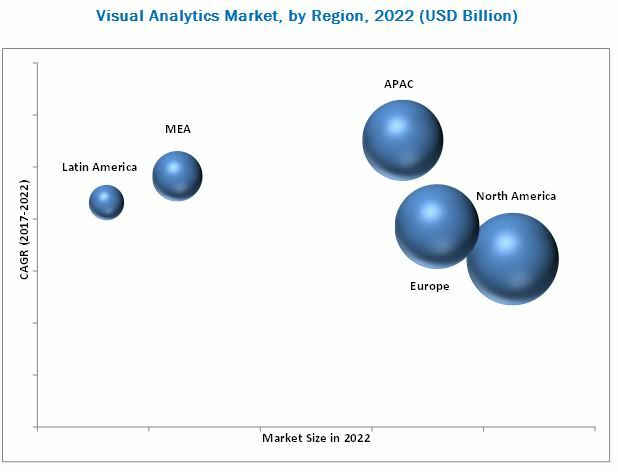 The visual analytics market size is expected to grow from USD 2.26 Billion in 2016 to USD 6.51 Billion by 2022, at a Compound Annual Growth Rate (CAGR) of 20.4%. 2016 is considered to be the base year, while the forecast period is 2017–2022. The research methodology used to estimate and forecast the visual analytics market began with capturing the data on key vendor’s revenues through secondary research sources, such as companies’ websites, Factiva, and Hoovers. The other secondary sources included annual reports, press releases, and investor presentations of companies; white papers and certified publications; and articles from recognized authors, directories, and databases. The vendor offerings were also taken into consideration to determine the market segmentation. The bottom-up procedure was employed to arrive at the overall market size of the global visual analytics market from the revenue of the key players in the market. After arriving at the overall market size, the total market was split into several segments and subsegments, which were then verified through primary research by conducting extensive interviews with the key people, such as Chief Executive Officers (CEOs), Vice Presidents (VPs), directors, and executives. The data triangulation and market breakdown procedures were employed to complete the overall market engineering process and arrive at the exact statistics for all the segments and subsegments. The breakdown of profiles of primary is depicted in the below figure. The visual analytics ecosystem comprises vendors, such as IBM (US), Oracle (US), SAP (Germany), SAS Institute (US), Tableau Software (US), Microsoft (US), MicroStrategy (US), TIBCO Software (US), Qlik (US), and Alteryx (US). The other stakeholders in the visual analytics market include analytics service providers, consulting service providers, Information Technology (IT) service providers, resellers, enterprise users, and technology providers. The study answers several questions for the stakeholders, primarily, which market segments to focus in the next 2-5 years for prioritizing the efforts and investments. The visual analytics market is expected to grow from USD 2.57 Billion in 2017 to USD 6.51 Billion by 2022, at a Compound Annual Growth Rate (CAGR) of 20.4%. The major growth drivers of the market include the rapid growth in volume and variety of business data, growing need for data-driven decision-making, and increasing demand for advanced analytics. The visual analytics market is segmented by software and services. The services segment is expected to grow at the highest CAGR during the forecast period, out of which, deployment and integration services in the professional services segment is projected to witness the highest demand, due to the growing need of visual analytics software solutions across organizations. The Banking, Financial Services, and Insurance (BFSI) industry is expected to hold the largest share of the visual analytics market in 2017. The growth is fueled by the growing need to simplify the workload related to security and the increasing dependence on data generated from various Information Technology (IT) systems, used for financial transactions. The transportation and logistics industry is expected to grow at the highest CAGR during the forecast period, due to the increasing need to store and manage data coming from various connected transportation devices and logistics record systems, used across transportation and logistics organizations. The major business functions for which the visual analytics is deployed include the IT, sales and marketing, supply chain, finance, Human Resources (HR), and others (product management and shop floor). The adoption of visual analytics for IT is expected to increase significantly in the coming years because of the increasing need to resolve IT-related issues in real-time and streamline the business process across industries. Organizations are deploying visual analytics solutions either on-premises or on-demand (cloud). The demand for cloud-based visual analytics solutions is expected to grow, due to its cost-effective and time-efficient features; its growth is expected to be high, particularly in the Small and Medium-sized Enterprises (SMEs), where low-cost solutions are largely required. The global market has been segmented on the basis of regions into North America, Europe, Asia Pacific (APAC), Latin America, and Middle East and Africa (MEA). The North American region, followed by Europe, is expected to continue as the largest revenue-generating region for the visual analytics vendors, for the next 5 years. This is mainly because, in the developed economies of the US and Canada, there is a high focus on innovations obtained from Research and Development (R&D) and technologies. The APAC region is expected to be the fastest-growing region in the visual analytics market because of the increasing adoption of Internet of Things (IoT) and smart technologies, and various other government initiatives, such as smart cities across the APAC countries, including China and India. The visual analytics market faces challenges, such as managing data quality and safety, and lack of skilled workforce. Factors such as lack of integration with legacy systems and complex analytical process are expected to limit the market growth. The major vendors that offer visual analytics software and services globally are IBM (US), Oracle (US), SAP (Germany), SAS Institute (US), Tableau Software (US), Microsoft (US), MicroStrategy (US), TIBCO Software (US), Qlik (US), and Alteryx (US). 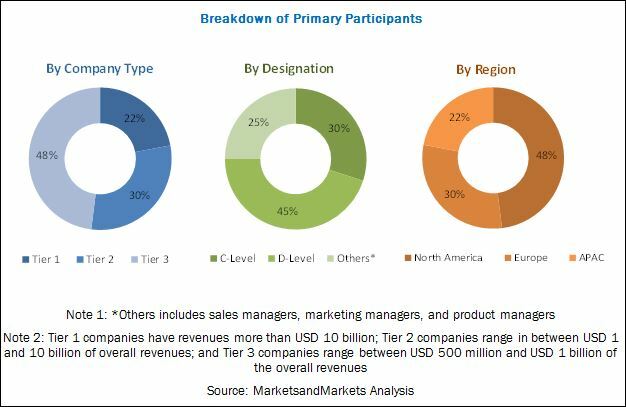 These vendors have adopted different types of organic and inorganic growth strategies, such as new product launches, product upgradations, partnerships and collaborations, and mergers and acquisitions, to expand their offerings in the visual analytics market. *Details on Business Overview Products Offered Recent Developments MnM View might not be captured in case of unlisted companies.